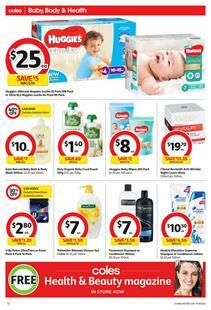 Stock up some baby care products at Coles. The latest Coles Catalogue showcases a number of products that are on sale. Buy baby nappies, wipes, and more for lower prices this week. Huggies ultimate nappies jumbo pack is only $25! Have a look at the organic foods for babies. Only organic baby food pouch is $1.40 at Coles. You can also find Easter decoration and colouring books on pg 33. Coles Easter bunny ears will cost only $3. Collect bonus points with gift cards. Also, household supplies are on sale. Check out the $6 saving on Omo Laundry powder. Coles also has a wide range of Duracell batteries on pg 34. Check out the pet supplies including dog and cat foods. Supercoat dry dog food costs only $10. Also, visit pg 36-37 to see mobile phones, Bonds underwear, and more products. Follow the Facebook page, subscribe to Coles Catalogue, and get the news from the future catalogues.